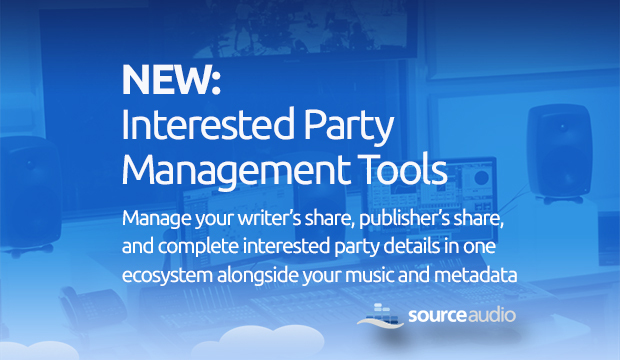 We have embarked upon the next evolution of the SourceAudio platform that will help you manage your creative rights administration business far more easily, affordably and effectively -- with much less time and money spent duplicating efforts across multiple systems -- than ever before. We know you pour a great amount of effort and detail into maintaining multiple systems to ensure your royalties and splits are tracked & managed so that your PRO payments can be distributed and reported as quickly and efficiently as possible. Our next goal as a platform is to make your catalog management and administration business easier on you, more efficient, and more powerful than it's ever been before. Up to this point on SourceAudio you've enjoyed total flexibility in displaying/managing your creative rights splits and metadata. For example, many of you use one field called "Publisher" and you include all splits within that field that probably look something like this: "Andrew Harding (ASCAP) 50% / Dan Korobkin (ASCAP) 50%". This data format helpful for quick reference and for looking up splits but it could be much more powerful by being organized in a way that allows it to better interact with external reports and systems (think cue sheet tools, file delivery, and PRO statements). To create and edit individual Interested Parties, visit your new "Interested Parties Tool" located in your main Admin Panel menu on the left. Create a new party on the right and manage/edit existing parties on the left. Like your metadata, we also support batch spreadsheet imports of Interested Parties now too! To use the new Interested Party import tool, first export a sample spreadsheet of your existing Interested Parties at the bottom of this new tool to see the format and fields we recommend you use. It's still very flexible and you can add as many parties as you'd like to add all at once. Interested Parties can also be added and edited on individual track detail pages. To edit your Publisher or Writer splits on a track detail page go into Secure/Edit mode just like you would to edit any field. Then, click the edit icon next to one of the new 'Standard' fields called "Publishers" or "Writers". Once you're editing your Writers or Publishers inline you'll see a new interaction appear that allows you to assign an existing Interested Party, create a new one, and assign the appropriate % splits for each party. See this screenshot below for a quick look at how it works. Many of you had your Writers splits in your Composer field or in a custom field called "Writers". For Publishing splits, many of you had this data in your "Publisher" field or another custom field that you created. We retained all of this metadata 100% for you in your existing fields but we also ran some scripts to parse out Last Names, First Names, and related splits for the writers and publishers you had in your metadata (including PRO affiliations etc. when available) and placed them nicely into your new Writers and Publishers fields. For those of you who had metadata to move to these new fields you will see that you now have many Interested Parties already created in your new Interested Parties tool. You'll also see your new "Writers" and "Publishers" fields now contain the relevant data you previously had available in its legacy format on your site. We didn't remove anything from your site - if you had data in your Composer, Publisher (renamed to "Publishing" now), or a custom field that contained this data it's still there. Feel free to delete, keep or hide it - it's totally your call! One important note: Because the previous versions of Writer and Publisher share data varied in format from site to site, we did the best we could to make sure it was parsed and put into the right place in the new Interested Parties fields. So, we hid these new fields for you so that you can have a look to see how the parsing turned out on your site. If you need to make any edits or do any clean up just go to your Interested Parties tool in the Admin Panel and edit each one right there. Save them once and they update site-wide. When you're ready to display these new fields (or if you want to display them at all) just un-hide them in your fields tool in the Admin Panel where you control the visibility of every metadata field on your site. » This is Part 1 of Our Catalog Management & Administration Tools -- What's Next? These new Interested Parties capabilities set the stage for the next phase of our new suite of catalog management and royalty administration tools coming very soon. Here's what you can expect to see next as we continue making progress on this empowering and time and money-saving suite of tools for you! More to come very soon...onward and upward! « What’s New: Hunter Williams Joins SourceAudio, New Features, NAB 2015, and More!